With its last refresh been done in 2013, Hyundai gained commendable appreciations for the Santa Fe. However the history repeated the saga at the Frankfurt Motor Show 2015 where company unveiled the latest Hyundai Santa Fe 2016 after more refreshments. 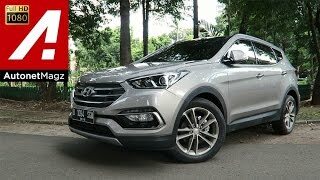 Let us have a look at the review of Hyundai Santa Fe 2016 to know more about it. 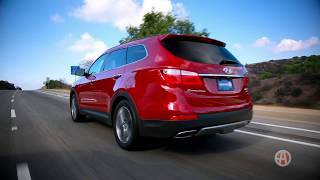 The interior of Hyundai Santa Fe 2016 narrates why it is one of the most popular SUV. The interior of the model isn’t just about looks and comfort but it also is loaded with many safety features like the Autonomous Emergency Braking, Around View Monitor, Blind Spot Detection, Smart Cruise Control and Dynamic Bending Lights. The refreshments for this model includes the one inculcated in creating the Center Console controls and audio visual navigation system giving more likeable stance to the model. High-end materials have been used to create the arena so as to provide comfort and luxury. The gorgeous steering wheel comes mounted with numerous controls that make the driver to ride without distraction. 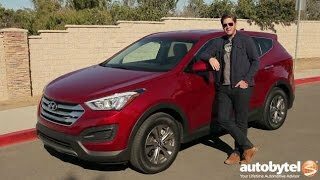 Rounding up the entire interior details of Hyundai Santa Fe 2016 I would say, it has safety, luxury, comfort and lots of space. Unlike interior the exterior of Hyundai Santa Fe 2016 doesn’t receives much refreshments. However those inculcated undoubtedly present the best impact. The parts that received refreshments include bolder grille with chrome surround, a redesigned bumper and new fog lights while the rear end has new bumper and a new set of taillights with updated graphics. Apart from these no major change can be noticed and here I believe nothing much was either needed. Powering the Hyundai Santa Fe 2016 are three engine options; two diesel engines and one petrol engine. The diesel engine lineup includes a 2.0 liter four cylinder engine generating total output of 148 hp and peak torque of 400 nm while the second one is a 2.2 liter four-cylinder producing total output of 198 hp and peak torque of 440 nm. 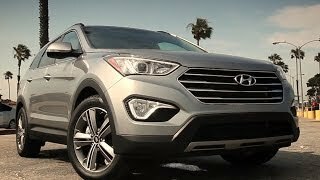 The 2.0 liter engine is paired to six-speed manual transmission while the later comes with an options of both six-speed manual/six-speed automatic transmission and can take the top speed of Hyundai Santa Fe 2016 to 112 mph and 126 mph while can sprint from 0-62 mph in 10.8 seconds and 9 seconds respectively. Talking about the petrol variant, it is a 2.4 liter four cylinder dual CVVT engine cranking total output of 185 hp and peak torque of 241 nm. With this engine the top speed of Hyundai Santa Fe 2016 touches the mark of 125 mph and can sprint from 0-62 mph in 9.9 seconds.